(13) Mick Jaguar. 14) Bull Clinton. 10) Chicken Pox. Series 1 -. Series 2 -. 15) Buddy the Dog. 2) Matt the Fat Bat. Pat and Lynn. There is nothing we can do about that. This can take anywhere from 2 weeks to 8 weeks. Up for sale is a new series 3 Grim Beaver plush with tags. Check out my 100% positive feedback and bid with confidence. Smoke free home. The orange piece was the rare chase piece in the set. 2 Sigmund Freud Beanies. 1 William Shakespeare Beanie. Up for sale is a lot of 3 Meanies from series 3. All are new with original tags. Included is: Bad Hare Day Grim Beaver No Brainer Check out my 100% positive feedback and bid with confidence. Smoke free home. "Get Lucky" Though missing his foot, he's not slowing. Perfect?????. Valentine gift for the one you love??. It's unique any way. HURLEY THE PUKIN' TOUCAN. These bean bag toys were produced in far lesser numbers than Beanie Babies and have a devout following. Series One. Cause of his fallen shorts. His staff couldnt get out of the way. hes in and out of courts. I may inadvertently omit information that you as a collector feel is important. Adult collector, Beanbag is in excellent condition, no wear or tear. By The Idea Factory (part of the infamous series). They were released when Beanie Babies were very popular, providing a humorous alternative in the beanie world. "No Fur-Be" (FURBY). Spoof of 1990's Beanies Craze! to spoof the hugely popular Bean Bag craze. were a very funny spoof of various characters and celebrities. 6" Tall Bean Bag Toy. This 6" tall PLUSH Toy is from the "TWISTED TOYS" Series. As you reached right on in and yanked out my still beating heart. Lot of 7 ~ IDEA FACTORY TEENY WEENIE MEANIES ~ 1997 SERIES 1 ~ KEYCHAINS - ZIPPER PULLS ( cute on Backpacks!) 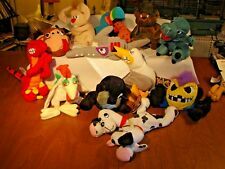 ~ PLUSH - Polyester Fiber - Plastic Beads used as stuffing material : ~ "Matt" the Fat Bat ~ "Boris" the Mucousaurus ~ "Bart" the Elephant ~ Armydillo "Dan" ~ "Fi-Do" the Dalmation ~ "Otis" the Octapunk ~ "Hurley" the Tucan ~ These keychains are all new and have never been used. They are all retired, some being more rare than others and and no longer being manufactured. Both the cloth body tags and the paper tags are still attached. Please see my photos as they are an integral part of my description. These keychains are all from a smoke free environment. Thanks for looking. Have a great day. Cold Turkey by the Idea Factory. Released in 199 8. Vulgar and funny. Short lived Beanie Baby competitor. Sunny the Preemie Chickie. He is in very good condition. He originally was a child's possession, not a collectible and therefore is not considered 'mint' but he is in very nice condition. Here is a beautiful genuine infamous meanies baby’s new with tags and plastic display case. bull Clinton 1997-1998 topkat,Llc. Please see all photos ask any questions happy to answer thank you. Dog eat dog series 3 Meanies. Check out my 100% positive feedback and bid with confidence. Smoke free home.